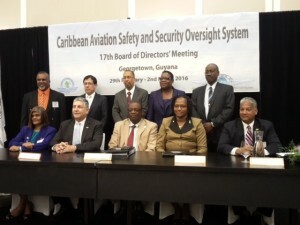 Guyana is among several Caribbean countries expected to receive assistance from the Caribbean Aviation Safety and Security Oversight System (CASSOS) to help reach a year-end deadline set by the global aviation watchdog agency to meet certain conditions. Speaking with Demerara Waves Online News following the opening of the 17th CASSOS Board meeting at the Marriot Hotel, CASSOS Chairman Nari-Williams Singh said steps are being taken to ensure all member-states reach an 80 percent effective implementation of standards approved by the International Civil Aviation Organisation (ICAO). The Guyana Civil Aviation Authority (GCAA) says ICAO has pegged Guyana at 40 percent implementation. In a message to the delegates delivered before the business session, Guyana’s Junior Public Infrastructure Minister said the 2016 National Budget provides for the GCAA to eventually hire trained and certified staff to improve its level of compliance. “In the budget, government made provisions to support the ICA compliance project and to upgrade our air navigation services by completing the implementation of the aeronautical surveillance service using ADS-B,” she said. While ICAO would not sanction countries for meeting the deadline, the CASSOS Chairman said major source countries for tourists could possibly blacklist certain destinations. “For some states, it may have implications for tourist arrivals. Europe has banned certain states from a particular continent from flying into Europe because of the low level of implementation of standards,” he said. The CASSOS Board Chairman said an overarching harmonised legal framework was being put in place to facilitate each member state tapping into others for various forms assistance in keeping with the ICAO rules. “When ICAO comes in to audit and they need to see certain structures in place for effective safety and security oversight, they want to see that there is a legal basis on which you can get resources from another state so that’s why it’s important for you to have in a legal and structured manner,” he said. Already, CASSOS has a trans-national inspector. CASSO, which was officially formed in 2008, is funded through equal contributions from each Member State. In addition, some technical and financial assistance for projects is received from donors including the United States.